1. Keep it cool and casual in this striped blouse. Get it from Amazon for $5.20+ (available in 12 colors, sizes S-3XL). 2. Turn heads in an absolutely gorgeous velvet top that's perfect for a chilly summer night or wearing to an AC-blasted office. Get it from Amazon for $11.99+ (available in three colors, sizes S-XL). 3. Be the trendiest person in the room by rocking this pom-pom shirt. 4. And if you're loving the blue/white/black color scheme but not feeling the pom-poms, go for this more subtly striped look. Get it from Forever 21 for $28 (sizes S-L). 5. Stock up on some casual off-the-shoulder T-shirts to go with any outfit you ever want to wear. Get it from Amazon for $4.99+ (available in nine colors, sizes XS-XL). 6. Rock the rainbow in this colorful ensemble. Get it from Target for $22.99 (sizes XS-2XL). Get it from Asos for $23 (sizes 2-14). 8. Switch things up thanks to a slit-sleeve top. Get it from Amazon for $16.99+ (available in three colors, sizes XS-L). 9. Sport a vintage look while wearing a simple striped number. Get it from Cotton:On for $7 (available in eight colors, sizes XS-L). 10. Blossom into the summer months in this frilly floral blouse. 11. Be classy AF by wearing an embroidered blouse. Get it from Forever 21 for $22.90 (sizes S-XL). 12. Add this versatile top to your wardrobe — it's perfect for work or a night out with friends. Get it from Target for $24.99 (available in two colors, sizes XS-2XL). 13. Show off your shoulders in this stunning tiered top. 14. 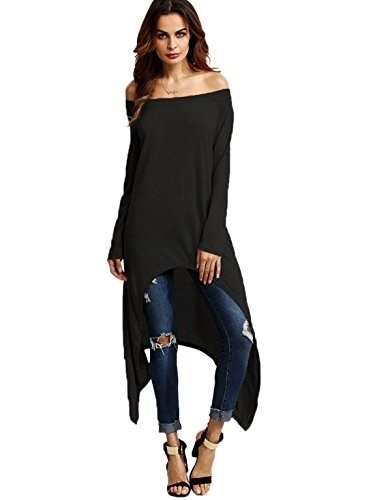 Save this long shirt that goes perfectly with jeans or leggings. Get it from Amazon for $9.99+ (available in three colors, sizes S-L). 15. Spice up your look with a patterned smocked shirt. Get it from Target for $19.99 (available in two colors, sizes XS-2XL). 16. Go a lil' crazy with some fun sleeves, like the ones this shirt has. Get it from Forever 21 for $28 (available in three colors, sizes S-L). 17. Go for an elegant summer look thanks to a flowy floral shirt. Get it from Forever 21 for $14.90 (sizes S-XL). 18. Travel back to August 1969 with this Woodstock-themed top. Get it from Nasty Gal for $30 (sizes S-L). 19. 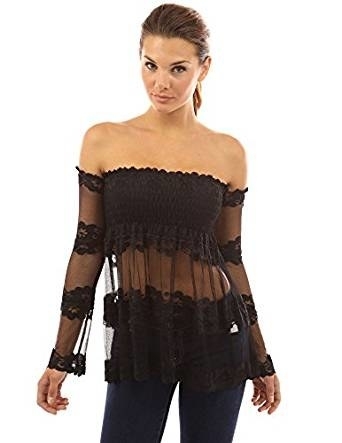 Dare to be different in a lace smocked blouse. Get it from Amazon for $26.99+ (available in two colors, sizes S-XL). 20. Go ahead and check(er) off this cute gingham blouse from the list of clothing items you said you would treat yourself to. And if you don't have a list like that, I advise you start making one. 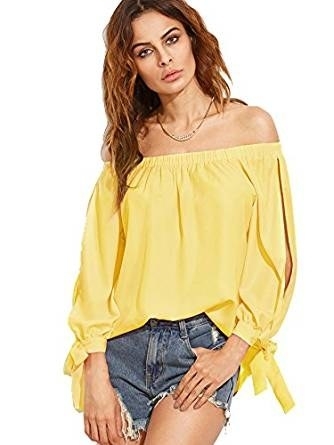 Get it from Asos for $23 (sizes petite 0-12). 21. Radiate like a flower in full-bloom thanks to this floral pink shirt. 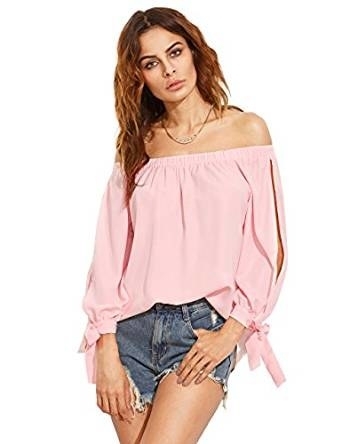 Get it from Asos for $23 (sizes petite 2-12). 22. Keep it simple with a basic off-the-shoulder top. Get it from Asos for $14.50 (sizes 2-10).